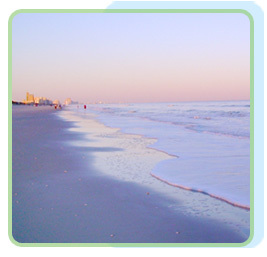 Myrtle Beach and the Grand Strand are home to millions of visitors every year. With so much to do, no wonder vacationers keep coming back to do it all over again! The white, sandy beaches are some of the widest on the East Coast, and ocean temperatures stay consistently warm and pleasant. Golfers can enjoy championship courses, while shoppers have the choice of two major malls and dozens of shopping outlets. Thrill rides are here for the young and the young at heart, while parks, museums, and nature attractions showcase the best of the area. Use our guide below to find out more about Myrtle Beach! Myrtle Beach lies at the very center of the busy 60-mile long Grand Strand area. Incorporated in 1957, Myrtle Beach has quickly grown and become one of the most popular vacation destinations in the world! An estimated 13 million visitors call Myrtle Beach home every year, enjoying thrilling attractions, beautiful beaches, world class golf courses, and countless shopping venues. North Myrtle Beach was formed in 1968 from the four existing beach communities of Cherry Grove, Ocean Drive, Crescent Beach, and Windy Hill Beach. North Myrtle Beach is a thriving "twin" city to Myrtle Beach with countless fine dining restaurants, attractions, shopping destinations, and free beaches. The two cities are only miles apart, giving visitors to each city a chance to enjoy the events and attractions of both! Murrells Inlet is not to be missed! Known as the seafood capitol of South Carolina, this local town is distinguished by salt marshes, quieter beaches, and beautiful ocean views. Local fishing is a major feature of the area, and mouthwatering seafood is a favorite of locals and visitors in the seafood markets and restaurants. Surfside Beach is another location that deserves a visit! With a famous pier, countless restaurants, and a beautiful oceanfront park, this town is beach living kept in a natural state. Ocean swimming, sun and sand activities, fishing and golfing are here for every visitor. Several public parks like the All Children's Park provide more beautiful spots for beachfront rest and play. Small, peaceful Garden City Beach is one of the area's most popular destinations. Temperate climate, pristine beaches, quiet atmosphere, and excellent service draw visitors again and again. A wide selection of nearby restaurants and attractions means that visitors can spend all day in this beautiful location. View Our Interactive Myrtle Beach Map! Find condos and local activities! Thousands of visitors every year take advantage of the light traffic, shorter lines, and lower rates of Myrtle Beach in the winter. Winter rates are a steal! Visit our Myrtle Beach winter rentals page for more information.